Our free of charge Virtual Mounting Service provides bespoke mounting solutions for iPad and Android tablets, eye gaze technology, switches or communication devices to the specific requirements of an individual. Simply complete this form and send it to us along with details of the environment and device you wish to mount. 1. The Environment - take at least five pictures of the environment i.e. the wheelchair or table, including a close up of where you would like the device to be mounted. 2. The Device - decide which device(s) you would like to be able to mount in the environment i.e. communication device, switch, eye gaze device, iPad, tablet, smartphone or iPhone. 3. The Solution - email your completed form to vms@inclusive.co.uk telling us about the environment and the device(s) you'd like to mount and attach your images. A bespoke quotation with a product code for your specific solution along with a visualised proposal of the mounting solution superimposed onto the environment images you provided. Once you place an order the mounting solution will be sent to you including assembly instructions. Please note: we provide a limited warranty on all REHAdapt parts in relation to their functionality as a mount. The warranty is life-long for production faults and 2 years for wear and tear. We do not take any liability for risks that might occur in conjunction with other appliances, specifically safety and functionality of wheelchairs or other mobility equipment. Any liability, including responsibility for the integrity of the mounted systems, remains with the providers of the other appliances. 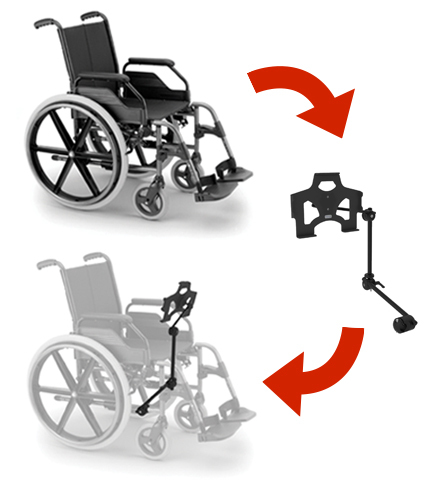 The person assembling the mount holds responsibility for proper setup according to the assembly instructions.